Try the popular Swedish Pancake recipe below, then plan a trip to Lindsborg and enjoy the art galleries, museums and great shopping and dining. 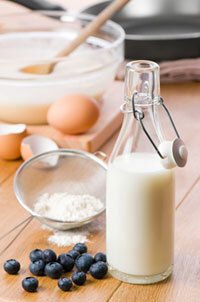 In a mixing bowl, combine eggs, half-and-half, flour, sugar, salt and melted butter. Beat with a wire whisk or rotary beater until combined and smooth (batter will be thin). Cover and chill for at least 8 hours or overnight. Cook over medium heat for 50-60 seconds or until bottom is golden brown. Turn pancake and cook until second side is golden brown. Repeat, greasing skillet occasionally. To serve, fold or roll pancakes and sprinkle with powdered sugar. Serve immediately with jam and, if you like, a dollop of sour cream.